Look, I’m all for haute cuisine. In fact, I’m tempted to lie and tell you that the picture to the right is pan-fried Fijiian oysters with julienned pommes de terre and saffron aioli. But it’s not. It’s chicken fingers and cheese fries. Sometimes you just want comfort food. Trim the chicken thighs, removing any excess fat. Cut into 1″ strips and place in a baking dish. Lightly salt and pepper the chicken and add the paprika and buttermilk. Cover and refrigerate 30 mins. Preheat the oven to 425 and adjust the top rack so it is 6-8″ from the top heating element. Combine the dry ingredients (Corn Flakes -pepper) in a food processor. Pulse a few times, but not too many that you end up with dust. Keep the mixture coarse for crispiness. Spread 1/2 of the Corn Flake mixture on a plate. 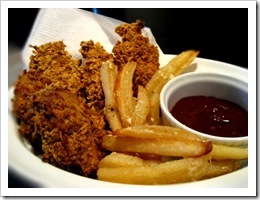 One by one, shake the chicken pieces dry and roll in the breading, coating thoroughly. Arrange on a greased or non-stick baking sheet. Bake for 15 minutes, flipping once. When 15 minutes is up, if they don’t look crispy, set your oven to broil and watch them closely (about 2-3 minutes). Serve with french fries (tossed with crumbled blue cheese and sea salt) and home-made BBQ sauce (sorry blog readers, I’ll never tell!). 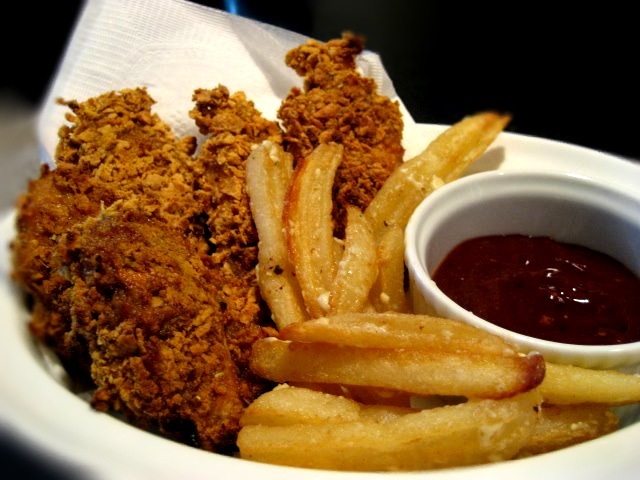 I love to eat chicken, thank you for sharing this recipe. you will be happy to visit mahjong . it is the most popular game website. I like to play sudoku online game it is good to play because it is classic and entertaining game in this no need to install.